Successfully Added Intruder Deterrent with Motion Detect Video Recording to your Shopping Cart. Keep your home safe and ward off any would-be burglars with this Intruder Deterrent. Also includes motion detect video and audio recording. Just point and aim this Intruder Deterrent at a window, door, or any other area you want under surveillance and its passive infrared sensor (which automatically detects any heat and motion-based changes) will take care of the rest. When the sensor is triggered, this Intruder Deterrent will automatically start recording video onto a micro SD card (up to 32GB) and also shine its ultra-bright 34 white LED lights at the target. Imagine this: Not only will this surprise any would-be burglars, but it should also scare them off and keep your home safe and intruder-free. This Intruder Deterrent is easy to install and requires minimal setup. Thanks to the light weight and compact size, you can put it anywhere for an instant home sentry and security device. 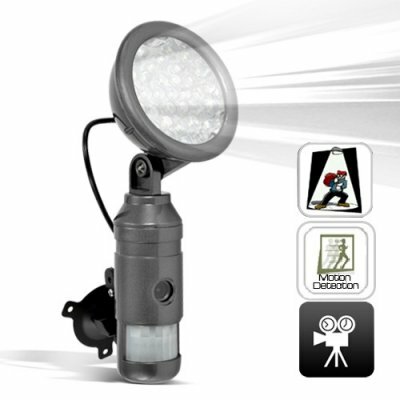 The LED head is also adjustable and allows for even more flexibility and placement options. Available in our warehouse now, order today and we will express ship it out tomorrow! Brought to you by the leader in China Electronics - Chinavasion. Does this video recorder include audio? Is there a time stamp? Yes! Check the contents on the CD to learn how to change the time.